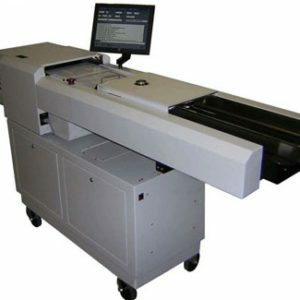 GBR 438 Smart Feeder/Folder - Roberts Business Machines, Inc. 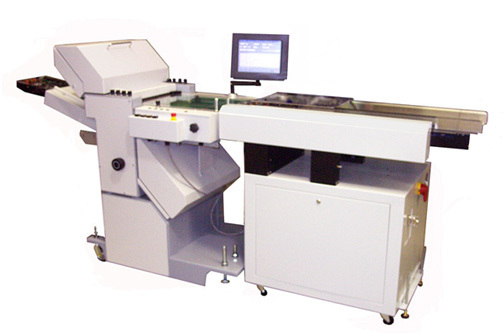 The GBR 438 Smart Feeder/Folder, is the highest quality intelligent feeder/folder system in the mail industry. Utilizing a heavy-duty folder with poly-steel rollers, the GBR 438 is designed for maximum productivity, 24-hour, seven day a week production. 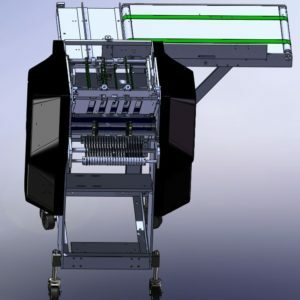 The GBR 438 Smart Feeder/Folder, is a large capacity top-loading, bottom feeder (approximately 1,500 sheets); four plate folder with accumulation station for up to eight pages for a letter fold and 12 pages for a half fold – 24 lb. bond paper. The GBR 438 has a double detect monitor and non-read fixed count operation along with an intelligent error display including mis-feed and jam detection. Optionally, the GBR 438 can support line code read system (OMR); Industry standard 1-D barcodes: 3 of 9, 128, and 2 of 5 interleaved; and 2-D barcode – Data Matrix; OCR/2-D barcode with Mailcrafters Lake Imaging Systems camera-based IntegraVision systems. The BSA 5000 high capacity loader increases loading capacity to approximately 6,5000 sheets or more for the GBR 438 Smart Feeder/Folder.